Hi there! My name is Milo, wanna be my friend? 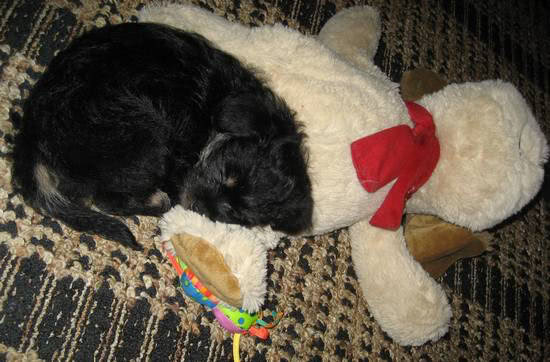 I was born on September 6th, 2011 and I’m 10 weeks old. I came to live with my new mommy last Friday. 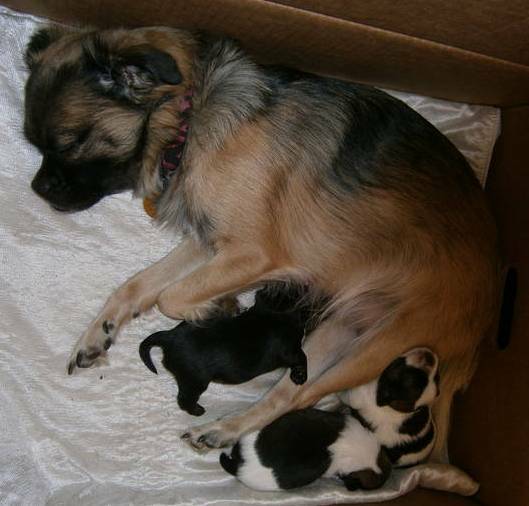 Here’s a picture of me and my brothers at two weeks old with our mom. 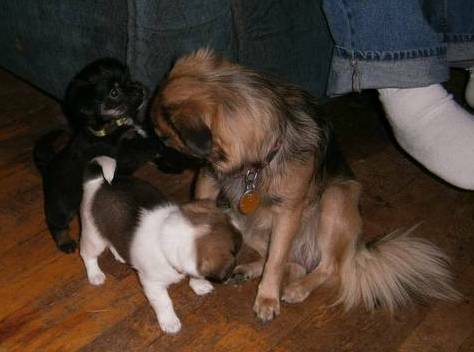 My mom is a Spaniel, Shih Tzu, Pug mix and weighs about 13 pounds. Here’s my dad. 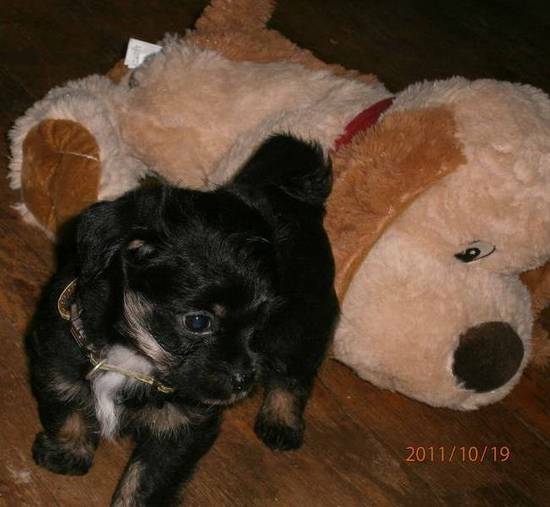 He’s a Chihuahua and Yorkie mix and weighs about 5 pounds. 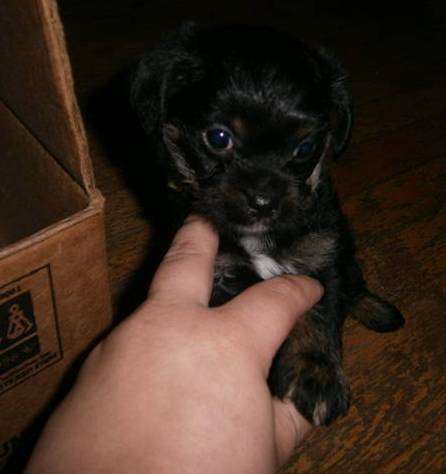 Here’s a picture of me at five weeks. 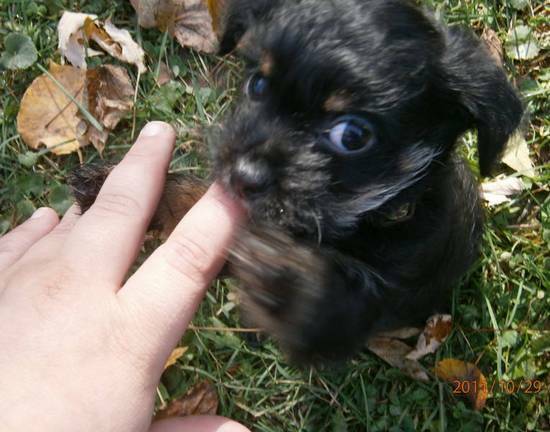 And a couple of pictures of me at 6 weeks. 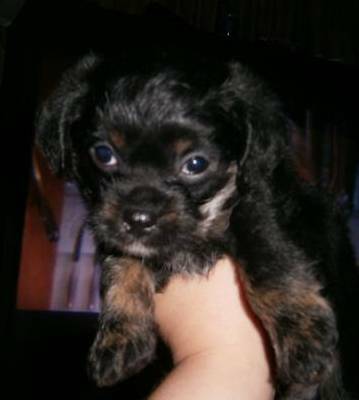 And a photo of me at 8 weeks. I went to the vet on Saturday and she says I’m perfectly healthy. 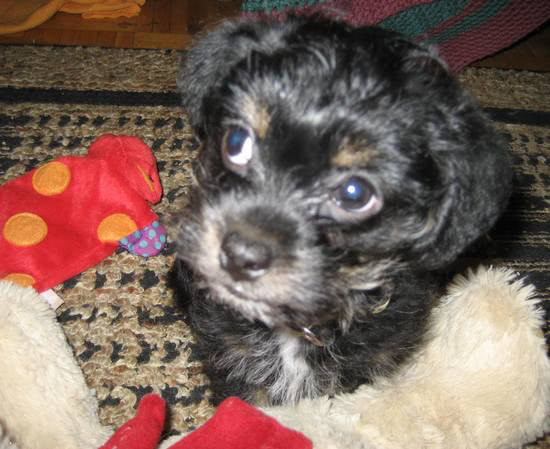 I weighed a whopping 3.5 pounds and the vet thinks I’ll get to be 10 pounds when I’m fully grown. I have a new bed and lots of toys at my new home. I helped my new mommy as she was drawing a quilt design the other day. I’m going to be a great quilt inspector. I love to go outside and do most of my business out there. Mom needs to learn to get up, dressed and then let me out of my crate in the mornings to go outside, cos I gotta GO! If I see you walking on the sidewalk, I will try to chase you, and if you don’t stop and say how adorable I am, I might even bark at you. Mom says I need Puppy Kindergarten. I really like my new home! Mom says I’m a great addition to the Quilting Gallery staff. oh-mah-gah he is so stinkin’ cute! cannot wait to see him! let him give his love right back to you. 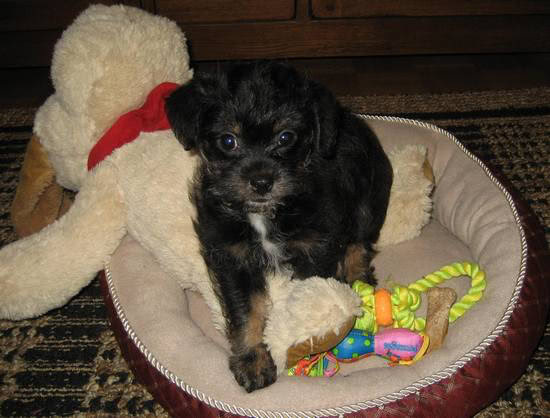 OMG – Milo is adorable! I hope we see a lot of him on the blog!!!! Welcome to Milo from all your Quilting Friends! We’ll come for a visit one of these days. What a wee little lad! Gosh he is a cute one, isn’t he? Well isn’t he just the cutest, I’m sure that he is going to bring smiles all year round. Milo is such a handsome guy, and so articulate! 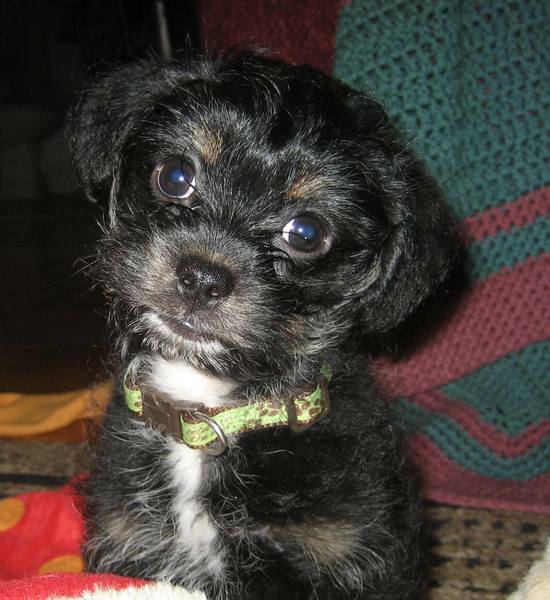 Just darling – lucky puppy & lucky Quilting Gallery staff! Thanks for sharing. So when is Milo going to Puppy Kindergarten? Awwww, that’s a serious case of cute you’ve got there! On a CUTE scale of 1-10, he is at least a 12. How adorable. OMG – Look at that face! Adorable! 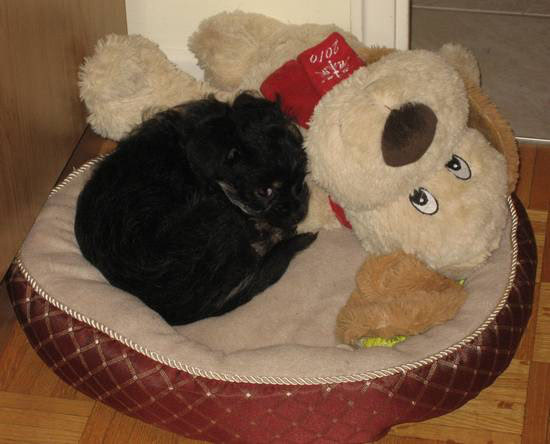 Hi Milo, yes, I’ll be your friend – please come visit! 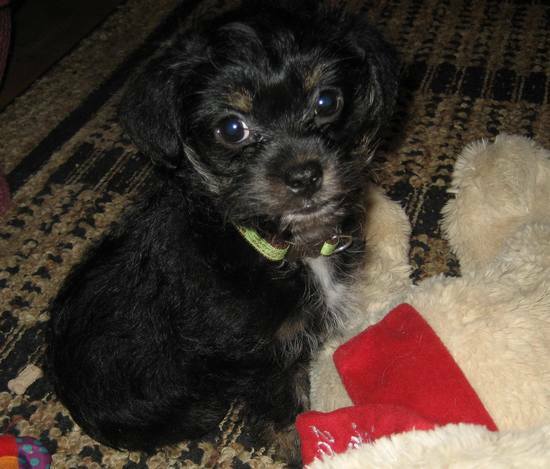 Oh, good golly – there just isn’t any cuter than Milo, and I’m afraid that even includes my adorable little pup!! What sweetness behind those big eyes!! He sure has lots of love to share – I’m glad you’ve found each other!!! 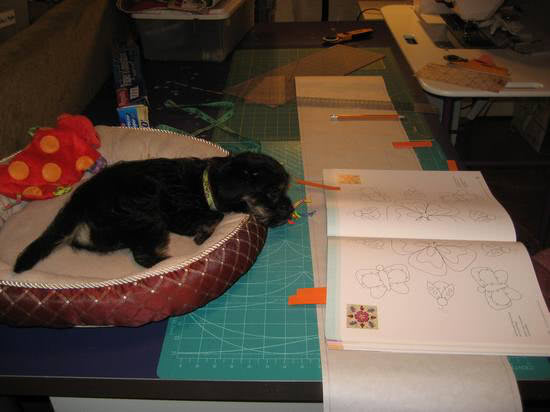 Welcome to Quilting Gallery, Milo….I’m sure you will be a great quilt inspector! Aaaaah Milo, I just want to cuddle you silly!! I’ve been waiting for these photo’s and I loved looking at all of them. 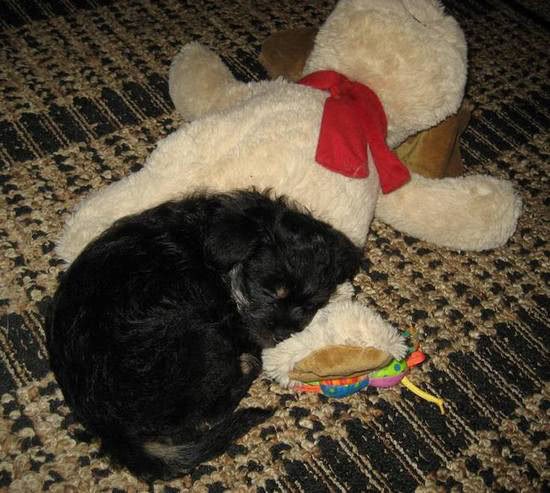 Mich, you did a wonderful thing, giving this little boy a good and loving home. I can’t tell you what Siep means to us, she’s the therapist around here and hears all the happy and sad things that go on. The love you get from such a wonderful creature is priceless. Í’m happy for you both and Siep says WOOF (meaning hi)!! Oh Milo, you are so cute. I’m confident you are going to grow up and be an excellent quilting inspector. Of course, I hope you and your mommie will take a photo of you on a quilt (showing how you help her) and enter it in the Pets on Quilts Show in 2012. Hi Milo! My dad created new roses and said hybrids are the best, strongest, and most beautiful. I can see that you are also quite advanced for your age with computer skills and all. You should make a very knowledgable quilt inspector some day. Nikko says the best thing she ever did was go to a puppy party. At that party she discovered that she is actually a dog too. Now she is an ambassador for dogs and people (and sometimes cats). May all your dreams come true! Well Milo, you are the cutest quilt inspector I’ve ever seen. Wishing you a long and very happy life in your new house. Cheers from Belgium. Welcome Milo. You are the cutest thing ever. I have a 5 month old puppy too. you’d love to play with him, it’s a shame he’s so far away. I love him! He is so precious!! OMG Milo is so cute. How adorable. You should have heard the ooohs and awwhhhs coming from me. Thanks for sharing! I think, I’m in love! Milo seems quite qualified for his new job! Darling! You are as goofy as I am about dogs. 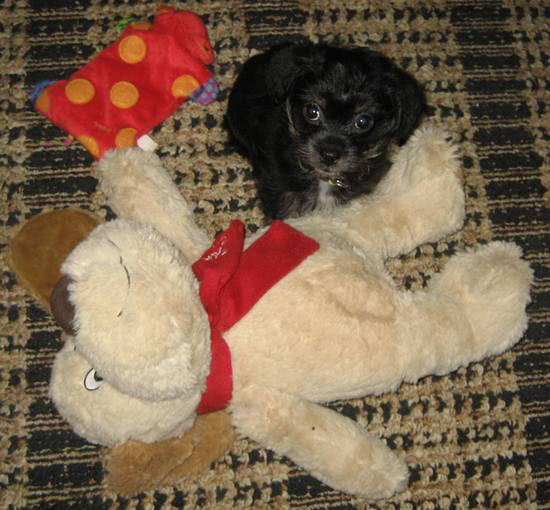 I have a photo album of “Putter” (we’re golfers) when she was a puppy – along with captions just like you have done. Whatever would we do without our buddies . . . .
Milo, you are absolutely adorable!!!! I think you have found a wonderful new home and wish you a long and happy life with your new family. Milo is just toooooo, too cute! I just want to hug him! If Milo gets his own web page, Mandu will be happy to let all his friends know. 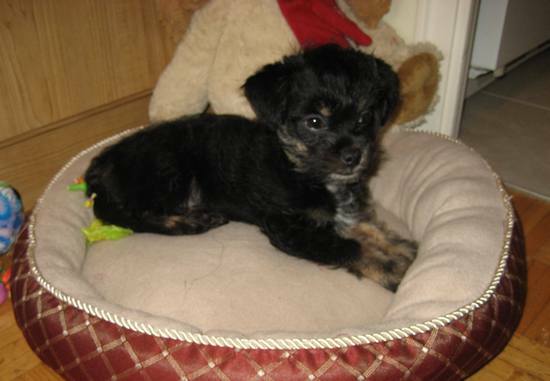 Ahhhhh….he is just ADORABLE!! Sooo sweet, Michele!! A.D.D.O.R.A.B.L.E and those are the most expressive eyes, ever! No wonder mommy loves you so much! I have befriended you along with Scooter Simms…Ami simms B.I.G. dog! You should go over to his FB and get acquainted and pick up some new friends there!!!! Milo is so sweet. I can really empathise with you, as we have a thirteen week old cocker spaniel, who is a real time waster and needs a lot of looking after at the moment, though she’s getting easier every day. He is SO adorable! 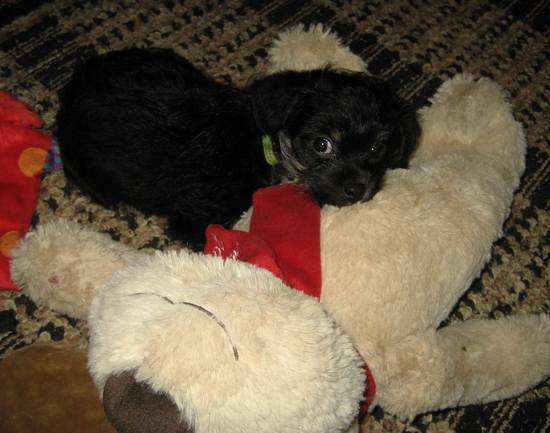 Thanks for sharing all the pics – reminded me of when our Cavalier was a pup! I vote for Milo as Top Quilt Inspector! Milo, I am in love with you I look forward to hearing all about your life. so cute! makes me love my 9 mo. old puppy a little more today! I’ve loved Milo!!!!!! I want to see him a lot of time in this blog! Nana Calling. We now have two wonderful grand puppies I hope you will have a wonderful time with Spencer (# 1 Grand Puppy) and our family dog Barney. Lucy and Alice are just going to want to hug you forever. I can’t wait for the family picture at Christmas, and to meet you. Grandpa says, oh yea another dog to walk on Christmas morning!! !, but I kow he is anxiously waiting your visit. You are really a lucky boy to get such a wonderful Mommy, she adores you. He is sooooo cute! And very photogenic! 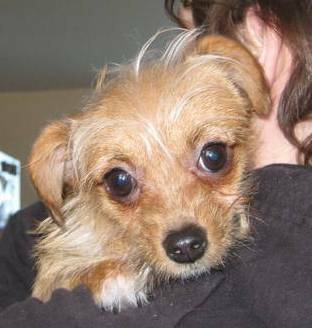 Welcome Milo, you can come on over for your frist play date any time…..
My dog ” Dumplyn” is s Yorky mix 8.3 lbs and is my brown eyed girl…. Oh Milo, you are a lucky little quilt inspector. You will get to see lots of things while you are working at the quilt gallery. Now do a good job of keeping Mommy amused. You are the cutest little thing. I won’t get to meet you in person until after the snow comes and goes but I do look forward to it. I can’t tell you what Siep means to us, she’s the therapist around here and hears all the happy and sad things that go on. You should have heard the ooohs and awwhhhs coming from me. He’s way cute! It will be an adventure.